So the last of the painfully long "Harry Potter" saga is scheduled to be released this week, I am so happy let me tell you why, only because its over, these actors were kids when it first began now they are old with grand kids (joke) anyway the last movie was a total yawn I was surprised they made another. SMH. 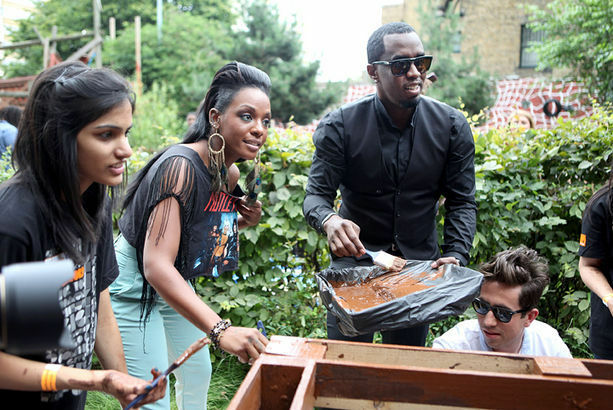 Oh Oh Dawn and Diddy help out a London Community by painting a playground. Question how is Diddy painting in that outfit, I mean seriously? Please this is just what it looks like a total photo opp, real painters wear white or something they can get dirty not an Armani suit.